Written by William Inge, an American playwright, Come Back Little Sheba on Broadway is about a drunk husband and an untidy wife leading a miserable marital life. Their sedate lives are suddenly ruffled when a young lively college girl comes to stay with them. The play talks about their individual resentment and the state of their lowly lives. There is a brief spurt of life in their loveless marriage and lives when a young spirited college girl comes to stay as a boarder in their lowly Midwest house. The wife, Lola, is a beauty queen of yesteryears and finds herself trapped in an unhappy marriage to a man who is a recovering alcoholic waiting for an excuse to take to the bottle again. Their lives take a turn forever when a young vivacious girl becomes a boarder in their house. For Lola the girl in many ways fills up the loss of her dog Sheba. For the Doc, the girl seems to be all that his wife is not. The girl is young, attractive, a virgin and somewhere along the play he realize that she is exactly like what his wife was in her younger days. Come Back Little Sheba on Broadway talks of various aspects of human life. The play discusses alcoholism, sexuality, rage, betrayal, domestic violence, and high strung emotions. The play is an honest attempt at portraying the lives of two individuals with their own share of burdened past trapped in a loveless marriage. The play is centered on Lola and as the play progress one goes through varying emotions for her. You feel sorry at one moment, and then angry for her, then angry at her, at times you want to shake her too. Since Lola is the central character in the play, the director did well by casting S. Epatha Merkerson as Lola. This beautiful actress does a brilliant job of bringing to life a totally colorless character. As a mother who lost her child and then her dog, she portrays loneliness and yearning for that long lost dog beautifully. Kevin Anderson as the Doc is also a wonderful choice in the play. He brilliantly portrays the alcoholic doctor on the brink of returning to the bottle. The doctor’s frustration at his condition, anger at his wife for jeopardizing his potential career, his lust for the young girl and his almost knightly wish to save the girl from a certain disastrous future are brilliantly played out by Kevin. Come Back Little Sheba on Broadway plays host to a series of emotions and talks about love that has vanished, hurt and betrayal in a relationship, unfulfilled promises, and lost hopes. Come Back Little Sheba on Broadway is a wonderful tale that is relevant for all eras. The play is best enjoyed if you are view it from center row seats. To enjoy the play to the fullest all you need to do is book your tickets through our authorized ticket brokers. We will book you the best available seat in the theater and ensure that you experience the best. A play worth every cent spent on its ticket. 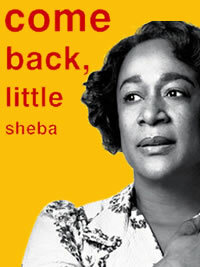 To view a great online selection of Come Back Little Sheba On Broadway tickets click the link!